Use with reinforced or non-reinforced gummed tape from 1"-3" in width. 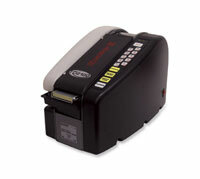 Choose cut lengths on tactile keypad that features 20 preset tape lengths from 4"-90". All metal construction with stainless steel guillotine cutter that requires less cleaning and adjustment. Large water bottle has rubber DuckBill valve. Constant hot water and flow through brush system evenly coats the entire length of the tape. Meets CSA and ETL approval. Dispenser accommodates a 1,000-foot roll of tape. Tape coder also available; call for details.